Royal Australian Air Force Anniversary Commemoration – 27 March Each Year, this day is officially recognised we do so with pride and appreciation to our founding member. Friday 25 April 2014, Form up under the XRAAF Banner Medals NOT miniatures, march direction for ANZAC Day and Procedures please follow the link. ANZAC Day Procedures 2014 Procedures unchanged at this point in time LOOK for updates. 0500 – Gunfire Breakfast. 0530 – Ex-servicemen & Women Muster. 0535 – Form up in Front of Cenotaph, 0545 – Service & Wreath Placing. 0600 – Breakfast at RSL. : Ecumenical Service will take place after dawn service at 0815. Parade Time: 0830 – Veterans requiring transport for the parade RSL Car Park. 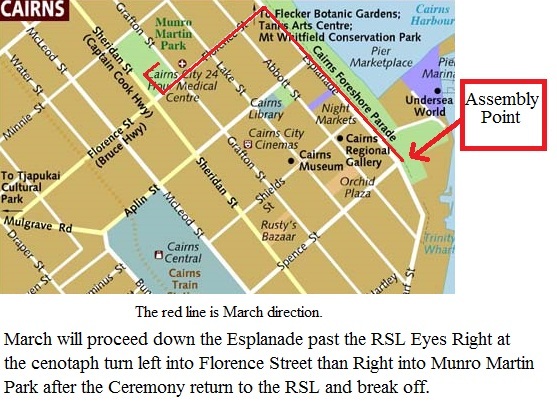 Parade Form up: 0845 – Spence St and Esplanade “Not in Fogarty Park”. Parade March Off: 0915 – Enroot to Munro Martin Park down the esplanade for the Observance crematory. ANZAC Day 2014 Service and March, well folks I expect we all enjoyed the Commemorative Services along with the very wet march down the esplanade. I must admit and admire the organising bodies of the ANZAC Day 2014 for their prompt quick action plan for the wet, it ran very smoothly all members from the RSL Executive’s our Mayor and his staff along with the Australian Defence Force our Queensland Police Service Fire and Rescue Service Ambulance service along the Australian Cadet Forces, indeed the entire business and local community. Every one played an important role in that ensuring that the event was a great success the list is far too long to mention but be assured you are there in our harts and we thank you all, lest we forget. Video of ANZAC Day 2014. 02 June 2014 a wreath will be placed at the Cairns Esplanade Cenotaph on the day similarly the same will be taken place Australia wide at our state capitals and territories, also abroad London Canada and New Zealand to honour, to pay tribute and to recognise the sacrifice of aircrew and ground crew during WW II, Followed by a Lunch or Dinner this will take place depending on a discussion by all members at the May 2014 meeting. Sunday 17 August 2014, Details: Memorial Service will be held on the Cairns Esplanade from 1700 HRS at the Cenotaph opposite the Cairns RSL Club, a wreath will be placed on behalf of the RAAFA Cairns Branch. Sunday 17 or the 10 August 2014, Casual Dress or RAAFA T/Shirt Rocky Creek Service Commences 11:00 HRS. we ask that as many members as possable represent our branch at this event and the placing of a wreath. The Royal Netherlands East Indies Air Force C-47 Dakota DT-941 (VH-RDK) with 20 persons on board, crashed near Mossman on Thursday 7 September 1944. It was on a flight from Merauke to Cairns. It left Merauke on 6 September 1944. There were no survivors. The crashed aircraft was not located until many years later in January 1989, the commemorative services will take place at the Cairns War Graves on the 07 September 2014 at 1000 hrs, after the service a morning tea is provided at the Cairns RSL Sub-Branch on the Esplanade. Commemoration – 14 September Luncheon the following will take place. Battle of Brittan Day; Sunday 14 September 2014, followed by a luncheon Cairns RSL, please be aware that this event coincides with our September monthly meeting. Please NOTE members this meeting is not at the end of the month it is on 14th SEPTEMBER 2014. Next meeting: (Second Sunday) 14 September 2014, RSL Dress; as required or RAAFA T/Shirt, 10:30 HRS For Wreath Placing, General Meeting at 11:00 HRS. Followed by Battle of Britain and Battle for Australia Commemorative Luncheon. Tuesday 11 November 2014, Dress Casual with Medals Form up in front of the Cenotaph Esplanade well before 11:00 HRS. Followed by a Lunch or Dinner this will take place Either before or on the day depending on a discussion by all members at the September 2014 meeting. Click on the link below for the Video of Remembrance Day 2014.